Hello, and Welcome to my blog. My name is Destany Fenton and I live in Northern Missouri. I have been painting in watercolor for nearly ten years, but I have been an artist my whole life. Even as a small child I was happiest when drawing and my family could see that it was a passion for me, even then. Being an artist has always been a large part of my identity. I was fortunate to be encouraged in my creativity and recieve private lessons througout my childhood. 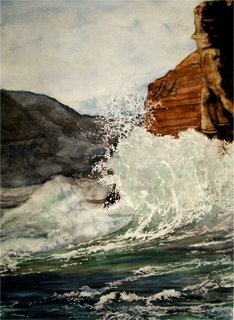 In 1997, I fell in love with watercolors. I enjoy the transluscent feel and ability to capture light that they offer, as well as their versatility and beauty. I find there is very little watercolors cannot do! I use them to paint on many surfaces, including eggs, wood, and traditional watercolor paper. It is my goal to achieve the rich color and detail in my paintings, and therefore the process can take a long time. But I enjoy building my paintings from concept to reality and creating a work of beauty where before there was only a blank sheet of paper. I consider my work to be "Enhanced Realism", meaning I paint realistically using much bolder colors and starker contrasts than what I actually see. I am not happy to create a photo perfect image, but to paint scenes the way I would like to see them. The way life and stories surrounding the objects color them in our imaginations to be bigger than ordinary. In many ways, I am creating an image of an object or scene that is more true to it's nature by striving to capture the emotion it envokes, or the personal history behind it.